ANDERSON Co., SC (WSPA) - The northeast corner of Anderson County is one of the fastest growing areas in Upstate. While many people are looking to move to the area for the school district that district is trying to balance the growth with deteriorating facilities. When you walk through the doors at Palmetto Middle School and you don't have to look far to see how old age hit hard. "I want my children to have the best education opportunity they have available to them and facilities is just part of the solution, we already have great teachers, great curriculum, but we need great facilities as well," said Sid Collins who is a concerned parent. This school is 67 years old with bathrooms that arent' working and doors to the outside with security flaws. But this isn't the only school in need of a rebuild. "We are at a point now where we have facility issues that need to be replaced completely and that takes funds in order to do that," said Superintendent Robbie Binnicker of Anderson District One. 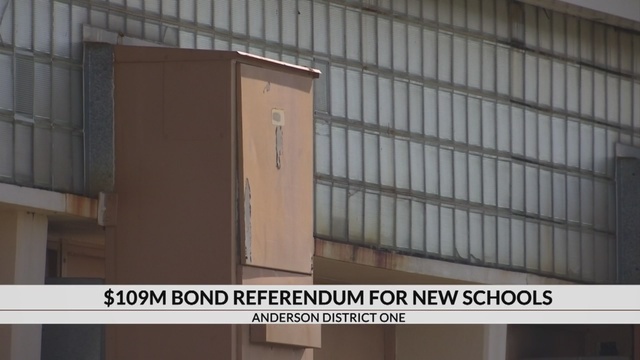 The Anderson One School Board has a $132 million dollar plan to build two new middle schools, improve security and add additions. "They have set aside $20 million dollars of local sales tax money over the next five years for the building plan and then $3 million from the general fund to be used for the facilities," Binnicker said. The remaining $109 million would come from a bond referendum if approved by the taxpayers. "How do you put a value on student safety and I as a taxpayer care about my property taxes are, but I also know that part of the value I have in my home is that the people who want to come here want to go to these schools," said Dan Bracken who is a concerned parent and local advocate. Since the district is in the middle of one of the fastest growing areas in the Upstate, adding more students to the current structures could be another problem. "We've gone from 7,600 students to 10,000 students if that were to maintain we would grow another 3,000 students and we already have facilities at or near capacity," Binnicker said. Without these upgrades and new buildings, some parents said there is no permanent fix. "They'll be more portables, it will be less security for our schools, it will be an environment not as ideal as it could be and this bond would solve a lot of our problems," Collins said. While raising taxes is never the goal, the school officials believe it is the best solution. "We need schools that will fit all the kids without portables and they need a 21st century learning environment," Bracken said. The school district plans to hold public meetings to answer any questions and break down the building plan ahead of the April 30th vote.